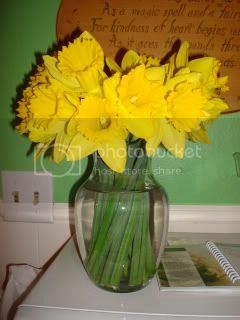 Bunches of daffodils were $1.50 for a bunch of 10 stems at the grocery store. They were all closed up, and it was an act of faith to take 'em out of a BOX where they were stacked up and expect them to bloom. But they did! They are so beautiful, and so yellow that they almost hurt your eyes. I LOVE IT! daffodils!!! against that green wall they are just perfecto. This page contains a single entry by MamaT published on March 16, 2009 8:17 AM. Fine Art Friday on Saturday - the Continuing Lent Edition was the previous entry in this blog.